Last night, I had a wonderful experience with my beloved Bhagavan Sri Skanda. I was undergoing some karmic obstacles in my life that prevented me from studying properly for my forthcoming board-certification exam in Internal Medicine (American Board of Internal Medicine = ABIM). As a result, I became very weary and lost confidence in myself and God’s ability to help me through this time. It was then when I had this dream. In my dream, I dreamt that I was in a temple surrounded by devotees. Though, I was happy to be with them, my heart and mind was worried about relocation to my new home along with my new job. It was at that time that a priest entered the temple and walked up to the shrine on the left. It was of Sri Ganesha! He did abishekam with water and milk to it and put vibhuthi and chanthanam and kungkumam on Vinayagar Perumaan and then proceeded over to the next shrine. I looked at the main shrine and it was of Bhagavan Sri Skanda with His shiny Vel! The priest did another abishekam for this statue but He appeared to look around for someone - like an assistant. He kept looking side-to-side waiting for his “assistant” to come but noone stepped forward. Seeing that the priest needed help, I got up from where I was sitting and picked up the tray containing the vibhuthi, chanthanam, and kungkumam. He looked at me with an expressionless face and took some vibhuthi from the tray and then smeared it on Lord Murugan’s forehead - making three distinct white lines. I was happy to see that. The priest then put a nice chanthanam and kungkumam potu on the statue. I was surprised as I didn’t even speak a word about my problems except to Murugan (in my heart). Yet, here was this priest (?Murugan) talking to me as if He had heard me. ?Murugan (priest) then looked at me, with the right hand that still had the vibhuthi that was smeared on Lord Murugan, He placed the vibhuthi on my forehead. I naturally bowed my head in humility, closed my eyes, and thought of Bhagavan Sri Skanda’s feet while the priest smeared my forehead with the sacred vibhuthi. All I remember hearing was the priest’s voice (?Murugan) in Tamil, “Kavalai padaathE.” [English meaning: “Don’t worry.”] With this I awoke. Your ever-longing child that wants to be with you. Last night, I had a wonderful experience with Bhagavan Sri Ganesha. Before I elucidate the details of this dream, I think it is important to give a little background on the real-life circumstances of my life that surrounded and lead to this vision. I am frantically preparing for my board certification exam in Internal Medicine and had only a few weeks left before my test date - yet, there was still an abundant amount of information that I needed to memorize and learn and understand before I felt adequately prepared for this exam. With the weight of this worry on my head, along with the weight of the information that I had to keep memorized, I felt into the trap of weary and self-doubt. I wasn’t sure how I was going to do this exam unless God comes and slaps me in the head and passes all that information into my small brain. The only sadhana that I had time for was singing Vinayagar Ahaval and Kolaru Pathigam. So, I quietly and discreetly got up and tried to sneak away from the crowd to go study. I then saw a door beside me and thinking it was an exit, I opened the door gently and proceeded through it. I then closed the door behind me quietly and turned around to notice an empty room with a person sitting in it. He was very fair in complexion, had nice big cheeks, a very big tummy and was dressed in a sannyasin clothing of orange-ochre colored robes. He had a grey beard and was seated on a white cloth and was leaning against the wall. He looked at me and smiled. I was surprised since I thought I had walked through an exit not into some swami’s (?Ganesha?) room. I responded by telling Him about my exam and how I am worried that I don’t feel adequately prepared and wished there was more time. I took comfort in (?) Lord Ganesha’s words and when I nodded in acknowledgement to His advice, He came close to me and smeared vibhuthi on my forehead. I felt so calm inside when He did this. I then awoke. Thank you my loving Lord for coming and blessing me with your sweet words of comfort and sacred vibhuthi. With your blessings and grace, I know I will successfully complete my forth-coming board-certification exam in Internal medicine. As the ABIM (American Board of Internal Medicine) exam approached, I became even more overwhelmed by the material I needed to learn. In spite of the fact that Sri Skanda and Sri Ganesha came into my dreams and reassured me, my mind was still stubbornly convinced that this exam was going to be difficult and a challenge. Nonetheless, I did not waiver with my sadhana - I continued to sing Vinayagar Ahaval and Kolaru Pathigam everyday and proceed with whatever I could do to learn the material for my board-certification exam. Last night (2 days before the actual exam), I dreamt that I was in my car garage and was pulling out to drive to my exam. As I was pulling out, I saw the garage door open from above me. As I drove out of the garage, I was about to make a left turn, but I thought I would do a shoulder check by looking right. It was then I saw a strange thing. I saw a gigantic elephant (?Ganesha) lying on its side. It was decorated with a big red kunkumam potu (bindhu) and three large streaks of vibhuthi adorned its forehead. It looked simply majestic - as if it belonged to a Maha Rajah (King)! As it sat on its left side, I saw its big torso go up and down as it breathed and rested silently. On top of its stomach was another surprise! A very young boy (?Murugan) sleeping on its torso. He was completely flat, lying on His back on top of the elephant. He was also sleeping and had his fingers from both hands clasped together - almost as if he was meditating on the elephant?! I was very happy to see the the boy (?Murugan) and His lovely elephant (?Ganesha). Something about seeing them made me feel so peaceful inside. What was amusing was that when the elephant (?Ganesha) took a deep breath, His torso expanded and that lifted the boy (?Murugan?) up and down - up and down! Up and down! It then struck me that I was getting late (in the dream). As I was about to press the gas and advance my car, the elephant lifted its head up and looked at me and I, too, looked back at Him into His serene and majestic eyes. It blinked at me and I blinked right back at Him. I then drove off to my exam (in the dream). It was then when I awoke. Today was my ABIM exam day. I didn’t sleep properly the night before due to anxiety about the exam. Nonetheless, I awoke at 3:30 am to get ready for my exam , which was scheduled to start at 7:30am. I performed puja with my loving wife and together we did a nice puja for Lord Ganesha and Bhagavan Sri Skanda. She then wished me well and sent me off. I managed to arrive at the exam center on time. I completed the registration process, which included fingerprinting and signing a pledge of honesty. The exam invigilator then guided me to my computer station where I was to complete this 6 hour exam. Before I even touched the computer, I put together my hands and closed my eyes and prayed to Sri Ganesha and Sri Skanda. I chanted their mantras (in my heart) and asked for their blessings in proceeding with this exam. Given the many obstacles that came to interfere with my exam preparation, I still was very thankful and grateful to them both for helping me to study this much. Hopefully, this would suffice to pass this exam. I then clicked the button, “Start Examination” and proceeded through the many questions that were presented to me. Strangely, I noticed something. I noticed that a majority of the questions that showed up on my exam were the areas that I had spent a great deal of time on! During my last few days of exam preparation, I quickly breezed through topics such as neurology and rheumatology. Ironically, a majority of questions were on topics that I spent most of my time studying. It was simply amazing to see that! I was very happy as it gave me more confidence in knowing that my two great Gods (Murugan and Ganesha) were helping me through this exam! I finished the exam without any difficulty with plenty of time to spare. I rushed home and celebrated the victory by doing paathanamaskar to Murugan and Ganesha at our home shrine. I also hugged my wife and thanked her for her incredible support that she gave me through this difficult time. I will let you know how I did on my exam in three months when the results will be published and sent to me. I was so thrilled and happy. All the hard work paid off! All the dreams that I had which foreshadowed this came true! Thank you my beloved Lord Muruga and Lord Ganesha. I couldn’t have done any of this without your help. Also, my lovely wife and parents who also supported me through this hard and challenging time - I am indebted to them immensely. Thank you! Thank you! Thank you! I am actually relieved. Because the other night, when I was working was a crazy night! I had saved 3 patients from death - I know had I not been aggressive with their care, they would have not survived in the morning. How embarassing it would have been that I save their life but was not board-certified in medicine?! 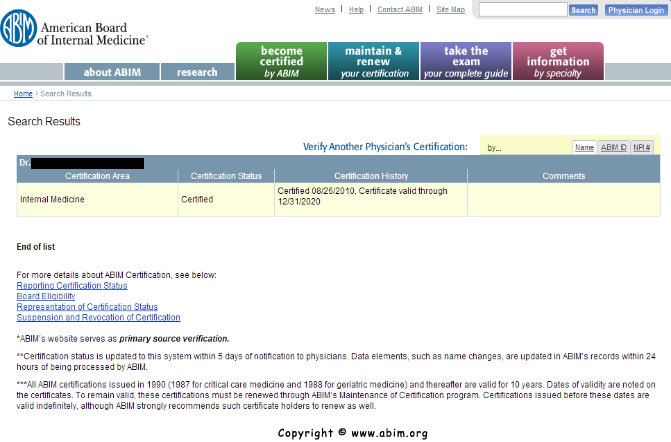 With this certification, I hope to continue to provide the service and care that my patients need and deserve. They are not just my patients, but Bhagavan’s children. I hope to continue to serve them - for service to them is no different from service to God.